Aside from buying trucks for their primary purpose, many truck buyers like to add a bit of its personality in their utes. Truck makers know that and they offer their machines in the variety of configurations and trims but special editions are also very popular. 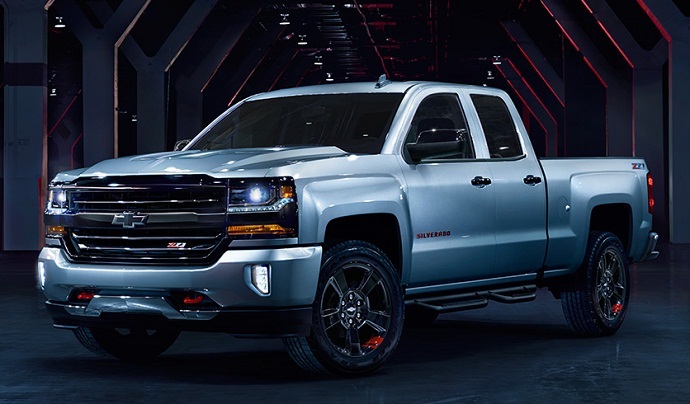 Chevrolet already offers a number of special models for its Silverado models but soon truck buyers will also get a chance to pick the 2018 Chevy Silverado Redline Edition. Chevrolet announced at the Chicago Auto Show that its popular trucks will wear a unique styling which gives a sportier attitude to them. However, this is not surprising as we already saw this maneuver from Chevy when it appeared at the 2015 SEMA Show in Los Angeles. Then, Chevy showed five models specially styled and they included models: the Malibu, Camaro, Trax, Colorado and Silverado. Obviously, Chevy tested how the public will respond to these models. Since it is bringing them to the showrooms we know the answer. And again, this Special edition won’t be reserved only for Silverado trucks. Chevy will offer nine of its models with the special look. Available will be Cruze LT, Camaro LT/SS, Malibu LT, Equinox LT, Trax LT, Traverse Premier, Colorado LT and Silverado Double Cab LT Z71, Crew Cab LTZ Z71. If you think that Chevy is alone among other truck makers that debuted the new Special edition models you are wrong. Ram also presented its Ram 1500 Chopper Sport version while Toyota offers the Tundra TRD Sport. When it comes to the 2018 Chevy Silverado Redline Edition, most of what we get is seen from the outside. All of Redline edition models get alloy wheels finished in black. The wheels comes with the red hash marks. The grilles on these models are also blacked-out. But special styling also includes black bowties rear and front, and individual badges with the black finish and red outlines. However, from there, each model adds specific elements. For us is important the Silverado which gets red tow hooks. As we mentioned above, this unique style will available on the Silverado 1500 Double Cab LT Z71 and Crew Cab LTZ Z71. That means that owners of specially styled trucks will also get their machines with off-road hardware. So, aside from being attractive, these trucks will be ready to attack all terrains. Unfortunately, the new 2018 Chevy Silverado Redline Edition doesn’t mean special or upgraded engine or engines. Chevy hasn’t also said would the new Silverado models get new or more poverful engines in response to Ford’s F-150 improvements in the engine lineup. Ford also brings the diesel mill and Chevy will remain alone among the light-duty leading trio without of diesel option. What is good, the 2018 Chevy Silverado Redline Edition will arrive first to the showrooms among the Redlined models. However, the all models will be available by the end of this year. Actually, the Silverado Redline Edition is already available for ordering.